Bori Bunder as seen from St. Thomas Cathedral (c. 1855-1862). 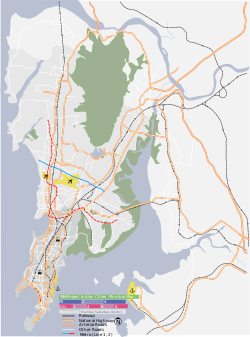 Bori Bunder (alternatively "Bori Bandar") is an area along the Eastern shore line of Mumbai, India. This place was used as a storehouse for goods imported and exported from Mumbai. In the native slang, 'Bori' mean sack and 'Bandar' means Bhandaar or store; Bandar also means port; So Bori Bunder literally means a place where sacks are stored. In the 1850s, the Great Indian Peninsular Railway built its railway terminus in this area and the station took its name as Bori Bunder. ^ "Pin code : Bori Bunder, Mumbai". pincode.org.in. Retrieved 9 February 2015. This page was last edited on 21 April 2019, at 11:51 (UTC).